VANCOUVER, B.C., Feb. 12, 2019 (GLOBE NEWSWIRE) -- Luminex Resources Corp. (TSXV: LR) (US OTC: LUMIF) (the “Company” or “Luminex”) would like to provide an update on its exploration and development project portfolio and its 2019 exploration plans in Ecuador. Luminex’s management is pleased with the progress to date and excited about the greenfield opportunities in the Company. Since the spin-out of Luminex from Lumina Gold Corp. (“Lumina”) in September 2018, the Company has prioritized and sequenced its work programs across the portfolio. Table 1 summarizes the 2019 exploration plans for each area of concessions. Development work on the Company’s mineral deposits at its Condor Gold-Copper project (“Condor” or the “Condor Project”), involving both Luminex’s exploration team and external consultants, aims to determine what further drilling and study will be necessary to maximize value at the project. In parallel, the Company is advancing its most prospective drill targets, Tarqui and Orquideas towards drill testing in 2019, while also advancing earlier stage projects. Mineral Resource Condor 10,101 Au-Cu Evaluating potential mining and processing scenarios to support a PEA study and exploration drilling that could enhance value. 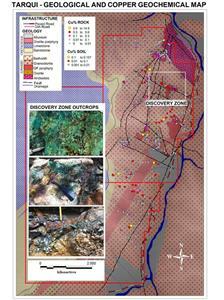 Mineralized Targets Tarqui 4,817 Cu-Au-Ag Expansion of discovery zone geochemical footprint. Applying for required permits for drilling. Orquideas* 4,743 Cu-Mo Awaiting permits for drilling, expected in H1 2019. 4,500 metre drill program planned. Pegasus* 67,360 Cu-Au First pass geochemical sampling, definition of mineral occurrences and drill targets as well as airborne ZTEM survey subject to permitting. Tres Picachos 4,828 Cu Trenching of ground magnetic anomalies and grid soil sampling program. Geochemical Anomalies Cascas* 9,998 Cu-Au Finalizing surface access to commence field work. Quimi 2,732 Cu-Au Extended geochemical sampling and follow up of legacy copper and gold anomalies. La Canela 3,187 Au First pass geochemical sampling, grid soil sampling on airborne geophysical target. * Subject to an earn-in agreement. See Luminex’s November 27, 2018 management’s discussion and analysis for further information. Note: The abbreviations EH, LC and SB denote El Hito, Los Cuyes and Santa Barbara deposits respectively. Mine and processing scenarios: The Company has engaged Independent Mining Consultants, Inc. (“IMC”) based out of Tucson, Arizona to evaluate the possible economic and mine engineering parameters of the mineral resources at Condor. IMC’s analysis is specifically focusing on the Los Cuyes diatreme-related epithermal gold-silver deposit and the Santa Barbara gold-copper porphyry-skarn deposit. The Company expects the results of the IMC study will direct exploration, resource definition drilling, further metallurgical work and guide Luminex towards identifying potential mining scenarios in support of a Preliminary Economic Assessment. This work is ongoing, may be supplemented by additional specialists, and is anticipated to be completed in the first half of 2019. Brownfields exploration: Detailed near-deposit geochemical exploration at the Condor Project camp facilities and the nearby Los Cuyes gold-silver deposit in Q4 2018 identified a gold mineralized extension to the district, the “Camp” target. 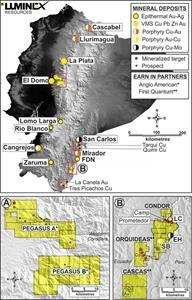 At the Prometedor target, located south of Los Cuyes, geochemical analysis of both legacy and Company soil and rock sample data has identified zones of coherent gold and silver anomalies up to 500 metres across. Further work at the Camp and Prometedor targets will be completed in preparation for a decision on exploratory drilling. Greenfields exploration: Reconnaissance exploration in underexplored areas of Condor continues to find geological indicators of the same silicified conglomerate basin fill that caps the Santa Barbara and Fruta del Norte gold deposits, as well as other exotic mineralized breccia zones similar to Los Cuyes. Part of a consistently mineralized copper porphyry system was discovered in the northern part of Tarqui in 2018, producing rock sample grades of up to 1.65% copper (see Lumina’s May 16, 2018 news release). The geochemical footprint, which is analogous to large copper porphyry deposits in this prolific belt extends over 1 x 1.5 kilometres. Additionally, polymetallic veins returning gold grades of up to 38 g/t gold; silver grades of up to 559 g/t silver and copper grades of up to 14.9% copper cut through the porphyry copper system. A total of 785 rock samples have been taken by Luminex from across the Tarqui concessions to date. Luminex plans to move to drill testing at Tarqui as soon as possible, defining targets through systematic ridge and spur soil auger sampling, grid soil sampling, continuous channel sampling in creeks, selective trenching, and possibly a ground-based induced polarization and magnetics survey. Outcrop observations and rock chip sample results received to date at the “Discovery Zone” target rank it as the highest priority. The company is expeditiously pursuing required permits and surface access negotiations with local stakeholders. At the Orquideas porphyry copper-molybdenum project, the Company is awaiting the requisite drilling and water permits in order to commence the previously announced 4,500 metre drill program. The Company anticipates these approvals in the first half of 2019. At Cascas the Company plans infill stream and soil sampling to enhance targets defined by legacy data, including the establishment of an exploration camp. Surface access agreements have been completed for Cascas 1 and are pending for part of Cascas 2. A geochemical sampling and geophysical exploration campaign mirroring the successful campaign conducted at Orquideas in 2018 will be used to define drill targets at Cascas. Anglo American Plc (“Anglo American”), the operator of the Pegasus concessions, commenced exploration activities in late 2018 after completing data compilation and desktop studies. Their current program focuses on: (1) stream sediment sampling; (2) rock-chip sampling; and, (3) geological mapping. This program builds on work performed by Lumina geologists prior to the earn-in agreement (see Luminex’s November 27, 2018 management’s discussion and analysis), when they identified several mineral occurrences, including skarn and porphyry-styles of mineralization. Subject to permitting, Anglo American plans to fly an airborne magnetic ZTEM survey this year. It is expected that Anglo American’s work will identify and rank mineralized targets for follow up exploration and drilling. Luminex commenced exploration activities at Quimi in late 2018. Of the 15 rock chip samples thus far obtained from porphyry-style mineralized material, the maximum assay retrieved is 1.6% Cu with 10.2 g/t Ag. Luminex plans to rapidly compile and interpret legacy geochemical data to define a systematic exploration program leading to drill target definition at Quimi in 2019. The Company recently completed a ground magnetic survey at Tres Picachos and identified a porphyry copper system characterized by magnetite veins assaying up to 9.5% Cu. Luminex’s geologists have determined that magnetite is associated with copper mineralization and that magnetic high features may be interpreted as copper target areas. These areas will be grid soil sampled and then trenched to define potential drill targets in 2019. At La Canela, 2019 began successfully with January results showing a 700-metre northeast-southwest oriented gold anomaly from soil auger samples, with maximum values of 0.28 g/t gold. The soil anomaly results are from legacy sampling data from Cambior and 73 new auger soil samples taken by Luminex geologists based out of a newly established field camp. All Luminex reconnaissance sample assay results reported herein have been independently monitored and verified through a quality control / quality assurance ("QA/QC") program including the insertion of blanks and the reanalysis of duplicate samples. Luminex samples are analyzed at ALS Lima and the company is not aware of any sampling, or other factors that could materially affect the accuracy or reliability of the data referred to herein. Leo Hathaway, P. Geo, Senior Vice President Exploration of Luminex and the Qualified Person as defined by National Instrument 43-101 Standards of Disclosure for Mineral Projects, has reviewed, verified and approved the scientific and technical information concerning the Condor Project in this news release and has verified the data underlying that scientific and technical information. Certain statements and information herein, including all statements that are not historical facts, contain forward-looking statements and forward-looking information within the meaning of applicable securities laws. Such forward-looking statements or information include but are not limited to statements or information with respect to: development work on the Company’s mineral deposits at its Condor Project determining what further drilling and study will be conducted at Condor; the Company’s proposed 2019 work schedule; the Company’s intentions for the results of the work program at Condor to direct resource definition drilling, further metallurgical test work and guide Luminex towards optimized mining scenarios in support of a Preliminary Economic Assessment; the work program at Condor being supplemented by additional specialists; the expected time of completion of the work program at Condor; further work at the Camp and Prometedor targets being completed in preparation for a decision on exploratory drilling; the receipt of permit approvals for drilling operations; commencement of the 4,500 metre drill program at Orquideas; a geochemical sampling and geophysical exploration campaign being carried out at the Cascas concessions; the results of negotiations with local communities and stakeholders to secure surface access at Cascas and Tarqui; moving to commence drill testing at Tarqui as soon as possible; timing of commencement of Anglo American’s airborne magnetic ZTEM survey at Pegasus; the expectation that Anglo American’s work will identify and rank mineralized targets for follow up exploration and drilling; and that magnetic areas at Tres Picachos will be grid soil sampled and then trenched to define potential drill targets in 2019. Often, but not always, forward-looking statements or information can be identified by the use of words such as “will”, “may”, “aims”, “intends”, “anticipates” or variations of those words and phrases or statements that certain actions, events or results are “intended” or “anticipated” to be taken, occur or be achieved.